Theosapien: "A Whole New Species of Being"
WWJBL? What Would Jesus Be Like? IF this is how you perceive Jesus, WHY is that? Who told you that Jesus was just an example for you to live up to? "You're not wearing your WWJD braclet today." another List of "DO THIS & DON'T DO THAT"? "He's making a list, checking it twice...gonna find out who's naughty and nice..."
Just what we needed; MORE Rules to follow! "Well, Who could it be? Could it be . . . "
"We like ourselves, don't we?" 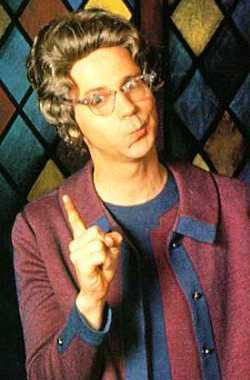 Church Lady, I've got no more time for your "BAD RELIGION"! Read an Eyewitness' account of What Jesus Is Really Like! & WHAT JESUS CAME TO DO. The GOOD NEWS- Gospel is so Very Good and so Very Simple that it would take RELIGION to MESS-Up this Message. God's Declaration of PEACE or Covenant of Peace was completed in JESUS as promised in Isaiah 53. The Angels also declared God's PEACE and Good Will towards ALL people to shepherds near Bethlehem when Jesus was born! Because of what Jesus has already finished for us, God is no longer counting our sins against us! He will never bring them up nor remember them! "Love Covers a multitude of sins." ALL THIS IS FROM GOD! What could you add to this Amazing GRACE? "The only thing that cheapens My Grace is when YOU try to add anything to it." i.e., literally; "monthly" disgusting, polluted garments, to the perfection of what has already been done for you by Jesus? "Theelectricrev...Jimmie Bratcher plays "Bad Religion"
Don't allow BAD RELIGION to mess up The GOOD NEWS GOSPEL! Because, NOT EVERY Gospel being preached today is GOOD NEWS. Paul's WARNING is for all of us. Rocky Green interview on CROSS WALK. Rocky's love and testimony lives on, "The words; Christianity, Salvation the impact of these words are lost on my generation... we all need hope, love, and forgiveness all people understand those concepts..."
I agree with JESUS, that Rocky is alive right NOW in GOD. Read it here: "...they are all alive to God." or the Quality of LIFE that God LIVES. If not NOW, when? What are we waiting for? John 10.6-10 Jesus told this simple story, but they had no idea what he was talking about. So he tried again. "I'll be explicit, then. I am the Gate for the sheep. All those others are up to no good—sheep stealers, every one of them. But the sheep didn't listen to them. I am the Gate. Anyone who goes through me will be cared for—will freely go in and out, and find pasture. A thief is only there to steal and kill and destroy. I came so they can have real and eternal life, more and better life than they ever dreamed of. Rocky, You rest in SHALOM of MESSIAH JESUS... soon brother, it won't be long til we see you again. This is a recent picture of the Shroud of Turin. Is it an image of the face of Jesus Christ? 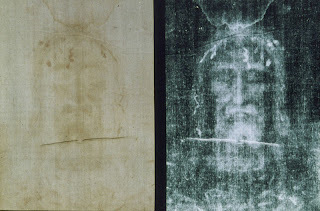 I have always been intrigued by the image of the man's face that was formed into the cloth of the Turin Shroud from the first time I saw it in National Geographic. Is it a true impression of Jesus The Messiah? "When I look in the mirror, do I see JESUS? You might be saying, "That's a dumb question...of course not, Jesus died 2000 years ago." "But when he, the Spirit of truth, comes, he will guide you into all truth. He will not speak on his own; he will speak only what he hears, and he will tell you what is yet to come. I'm on a journey, actually an exploration of this Mystery of the Gospel, that the Apostle Paul had revealed to him by Jesus himself, of the "CHRIST IN YOU" reality through this blog. You are welcome to join me in the journey and share your questions and insights. Verse 29 "because whom He did foreknow, He also did fore-appoint, conformed to the image of His Son, that he might be first-born among many brethren;"
Labels: Positive Right....Negative left (enhanced) of the Turin Shroud.